Transparent, colourless, toughened humidity-cured ethyl-based instant adhesive. Well suited to plastics, rubbers, metals and porous/acidic surfaces. 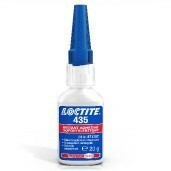 LOCTITE 435 is a colourless, toughened, ethyl-based instant adhesive. It has a fixture time of 10 - 20 secs. It has high resistance to impact and shock loads, high peel strength and is suitable for bonding plastics, rubber, metals, porous and absorbent substrates and acidic surfaces. Good resistance in humid environments. Fixture time of 10 - 20 secs.